It turns out that the fifth time is the charm – at least for the Western Lady Panthers basketball squad. There have been five different head coaches on the Western sideline in the last five years, but it was the fifth one – Chris Keisling – who guided this squad to where no other coach has. 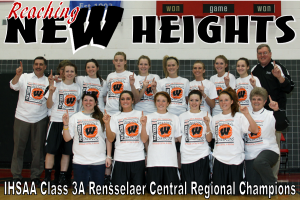 Last Saturday, the Lady Panthers won its first-ever regional crown as they defeated South Bend St. Joseph’s 36-34 to claim the Class 3A Rensselaer Central Regional and earn a berth in the programs first Final Four. The game was a defensive thriller – something the Panthers have specialized in during its tournament run. In fact, the squad has held nine consecutive opponents to under 45 points and six straight to under 40. Against St. Joseph’s, Western forced 23 turnovers and were led by the five second-half steals from sophomore guard Kiersten Durbin. “Tonight it was Durbin and she was unbelievable on the top in terms of creating turnovers and capitalizing on those turnovers with big buckets with play after play,” said Keisling. But when it was crunch time, Western looked to senior Indiana All-Star candidate and IUPUI recruit Nicole Rogers. Playing with four fouls, the sharpshooter drilled a step-back 3-pointer at the 4:08 mark of the fourth quarter to give Western a 32-29 lead – one they would not relinquish. But the senior was not finished as she hit her second fourth quarter triple – and fourth of the game – to put the Panthers up by four with 1:51 left. The Lady Indians cut the lead back to one, but Durbin knifed in and made her final steal of the night and Allison Lindley was fouled driving to the basket. She hit the front-end of the one-and-one to give the Panthers a 36-34 lead. Lindley missed the second, but the Panthers withstood game-winning attempts from St. Joe to secure its place in Panther lore. The road does not get any easier for Western (19-6) as it travels to the Class 3A North Semi-State at Warsaw High School. The Panthers face No. 7-ranked Fort Wayne Concordia Lutheran High School (19-5) at 4 p.m., with the Class 4A North Semi-State between Penn (25-1) and North Central (21-5) to follow. Hard work will be needed if this team wants to reach its ultimate goal – the IHSAA girls basketball state finals in Terre Haute. And with this group, that goal is obtainable. This entry was posted in Basketball, IHSAA, Indiana, Tournament, Western. Bookmark the permalink.